It is impossible to prevent water vapor's natural tendency to penetrate building exteriors. If this moisture is left unattended, however, it can cause many serious problems, compromising both structural integrity and sustainability. Maintaining a dry building envelope is crucial for any successful sustainable design project, as doing so has a significant impact on a variety of factors influencing the overall sustainability of a structure. When trapped inside a wall cavity for an extended period of time, moisture can cause many building materials, such as wood, traditional paper-faced gypsum and steel, to eventually deteriorate or corrode. In addition, wet insulation loses R-Value, which makes the building less energy efficient. The moisture problem that has received the most attention in recent years, however, is the mold growth caused when airborne mold spores make contact with wood- or paper-based materials in the wall assembly. When exposed to moisture for an extended amount of time, wood- and paper-based materials are a prime food source for mold. This mold growth can lower the indoor air quality of a building and have a negative impact on the comfort and respiratory health of occupants. Fortunately, all of these potential problems can be controlled with proper moisture management strategies. Many of the best such strategies for wall assemblies begin with two high-performance components - fiberglass insulation and a vapor barrier. Fiberglass has always been one of the most common insulation materials on the market, due to its strong performance in a variety of areas. Widely known for its high thermal resistance, fire resistance and sound absorbency, it is also an effective weapon against moisture and mold damage. Fiberglass insulation neither absorbs nor holds water and will not deteriorate from extended moisture exposure. Being an inert material, it is a non-viable food source for mold and will not support mold growth. 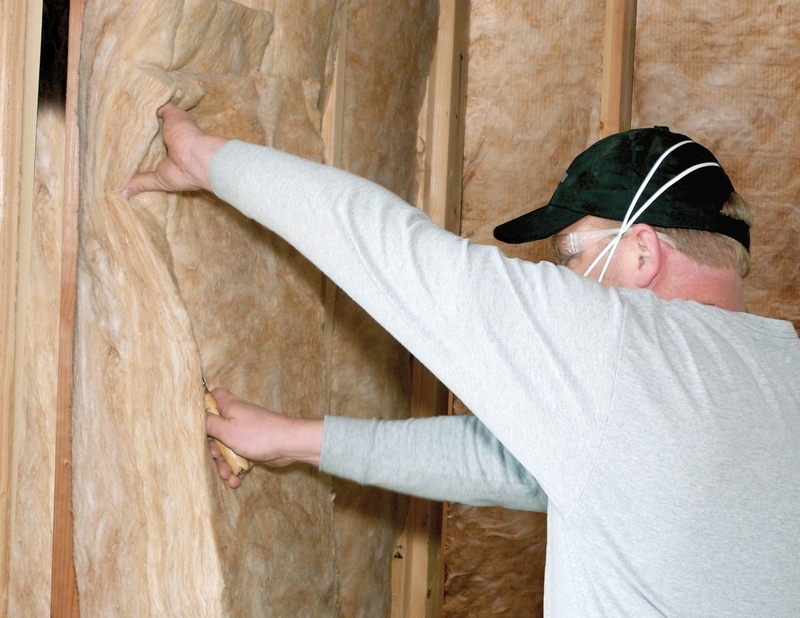 Fiberglass insulation cannot fight the battle against moisture intrusion alone, however. Vapor barriers applied over the face of the insulation provide additional benefits in the fight against moisture. Usually composed of a thin film, such as polyethylene, vapor barriers are used to retard or prevent water vapor diffusion into a wall, ceiling or floor during the cold winter. The performance of these materials is gauged by their water vapor transmission rate, or permeance. Permeance is the rate at which a measured amount of water vapor transfers through a known surface area under standard atmospheric pressure conditions. Water vapor permeance is defined in nanograms (ng) of water vapor, per second, per square meter, per Pascal. The National Building Code of Canada separates vapor barriers into two classes: Type 1 and Type 2. Type 1 vapor barriers are very restrictive to moisture transmission, having a permeance less than or equal to 15 ng/(Pa·s·m2) of moisture passage. These barriers are required where there is cladding on the house that doesn't allow enough drying to the outside. Type 2 vapor barriers, the basic vapor barrier for ordinary conditions, are defined as having a permeance less than or equal to 60 ng/(Pa·s·m2) of moisture passage. Prevalent vapor barrier materials used over the years have been polyethylene (Type 1), asphalt-impregnated or asphalt-coated kraft paper (Type 2) and foil skrim kraft (FSK) (Type 1) - paper-backed aluminum. In addition to fiberglass insulation and vapor barriers, the most successful moisture management strategies include a water resistive barrier, an interior air barrier and an exterior wind barrier to reduce the potential for seasonal surface condensation and rainwater penetration. By incorporating complementary smart vapor control products into the overall design, however, building and design professionals can simplify their moisture management strategy. CertainTeed's MemBrain Smart Vapor Retarder & Air Barrier Film is approved by the Canadian Construction Materials Centre (CCMC)1 for use in place of polyethylene, both as a vapor barrier and as an air barrier system within a building's exterior walls. Its adaptable permeance allows MemBrain to retard moisture under dry conditions, with a permeance of about 44 ng/(Pa·s·m2); but, as relative humidity within the cavity increases above 60 percent, it dramatically opens up to a permeance of up to 2,050 ng/(Pa·s·m2). This allows building and design professionals to prevent the entrance of moisture and allow cavity moisture to escape while maintaining a building's air barrier performance, all with one product. As we continue to learn about a dry building envelope's importance to the sustainability and energy efficiency of a structure, the need for today's higher performance fiberglass insulation and vapor barriers in exterior wall assemblies becomes more apparent. A building with an effective moisture management strategy and the proper insulation and vapor barrier selection is likely to be a more stable, energy-efficient building, with cleaner interior air and happier occupants. 1 Canadian Construction Materials Centre Evaluation Report CCMC 13278-R.